“What good are passion and creativity if we are not using them as daily tools? These are some major perks of being human,” says Gilat Ben-Dor, author of THE CONFETTI PATH: 101 Ways to Celebrate Your Passions and Inspire Creativity. At the moment, Gilat has arrived at a Starbucks coffee shop toting three black bags of different sizes. She shrugs, “Different bags for different businesses, right?” Gilat is preparing for the launch of not one, not two, but three new books all being released at once. “I’m either crazy or ambitious — I suspect a bit of both,” she wryly comments. In addition to THE CONFETTI PATH, Gilat Ben-Dor has recently published The Rainbow Blueprint: An Action Journal for Those With Many Passions, a 450+ tome containing one year’s worth of guided journal reflections geared towards people with many passions, and a companion activity book, The GUSTO POWER™ Workbook: Tactics and Strategies for the Multi-Passionate Professional. At the time of this interview, which is before the public book launch (“and Amazon”), each of these books is available through her publishing company, Gilat Ben-Dor Media, LLC and, for a limited time, pre-launch signed copies are available here. 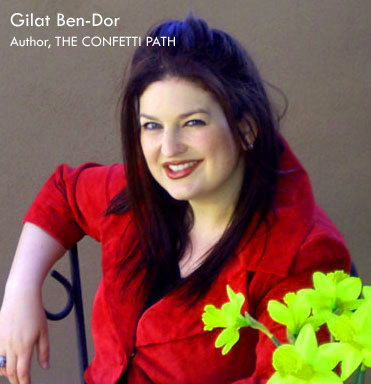 In addition to being an author, Gilat Ben-Dor is a professional speaker, coach, and creative entrepreneur. Gilat enjoys mixing the worlds of business and passion. She holds an MBA in Global Management, and a Mediation certificate, and has lived on four continents. Gilat Ben-Dor has formed her own publishing company (Gilat Ben-Dor Media, LLC), and to date, has created all of her own cover and interior designs for her books. As a former art, multimedia and graphic design professor at a private college, Gilat agrees that these skills come in handy. As a wine and culinary enthusiast, Gilat also holds five wine credentials and runs a successful wine education company, as well as an online art business featuring her works. Gilat Ben-Dor is a member of the National Speakers Association (NSA), the International Coach Federation (ICF), the Arizona Book Publishers Association (ABPA), Meeting Professionals International (MPI), and the Society of Wine Educators (SWE). Whew! © 2019 The Confetti Path™ | Gilat Ben-Dor.